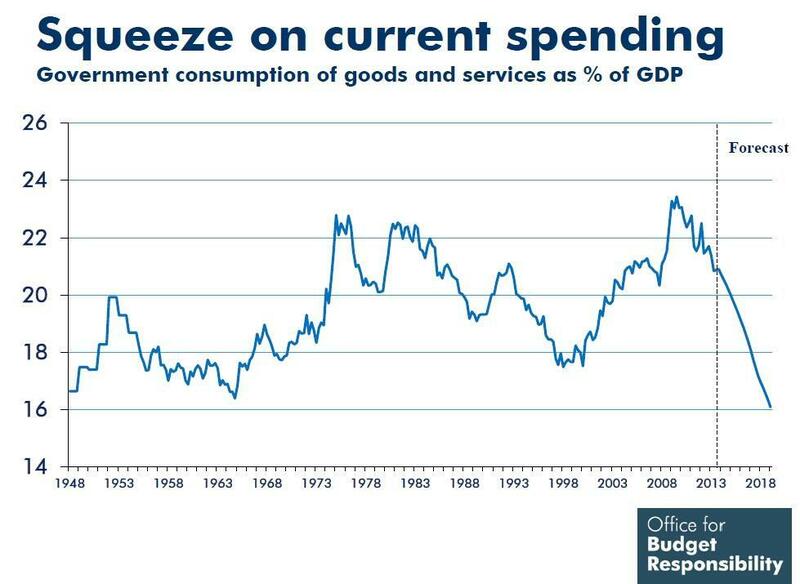 This chart from the Office for Budget Responsibility has attracted some comment, from Robert Peston http://www.bbc.co.uk/news/business-25240202 and Colin Talbot http://blog.policy.manchester.ac.uk/featured/2013/12/never-letting-a-goo... On the face of it, it looks as if the coalition is planning to take expenditure on public services down to a level below even that of 1948 by 2018, at 16% of GDP. Peston says 'This is pretty amazing', which is putting it mildly. What's going on? Talbot's interpretation is that 'what Mr Osborne plans is a fundamental downsizing of the British state'. Perhaps he does, but change on this scale would be at the outer limits of what Sir Humphrey would describe as 'courageous', and courage does not strike me as a defining characteristic of either Mr Osborne or his government. To put that 16% figure in context, health and education accounted for 12.4% of GDP in 2006-7, before the crisis. Even if growth is robust up to 2018, and assuming the government of the day continues to protect health and education spending, we'd be looking at less than 4% of national income left to cover the police, army, transport, personal social services, rubbish collection and so on. (The first three items on that list alone came to 6% of GDP in 2006-7). In other words, 16% is a silly figure. In saying this I intend no disrespect to the OBR. On the contrary, I assume they intend the figure to be seen as silly- as a covert critique of fiscal plans which, while coherent in a purely accounting sense, are essentially fantasy. In other words if all this happens- deficit elimination, higher debt interest and social security coupled with the forecast level of receipts- expenditure on services /must/ fall to 16% of GDP, as otherwise the sums won't come out. Which to this observer suggests that the sums don't come out - as a matter of political reality rather than accountancy. The Chancellor doesn't have 'plans' to reduce spending on public services to pre-welfare state levels. He doesn't have a plan at all, just a set of forecasts intended to maximise political advantage in the run-up to the next election. After which, assuming he is still chancellor, he will either raise taxes or reschedule fiscal consolidation again, as would any chancellor who inherits this mess. So the real message from this forecast, I suggest, is not about Conservative plans to roll back the state. It is that the government is going through the motions of offering completely irreconcilable outcomes in the hope that nobody will notice the implications until they've secured a second term. Is charity doing more to tackle poverty than government?